A few weeks ago, Al Gore made the untrue claim that “climate-related extreme weather events have grown far more numerous and far more destructive” in the time between his original film and the sequel. This claim was widely reported, by the BBC, the Guardian, News24, and in Gore’s Conversation with Mark Maslin. Since then, I’ve been asking for a climate scientist to have the integrity to call out Gore for his falsehood. I didn’t see any climate scientists doing this, although many of them were piling onto Nigel Lawson (who rightly called Gore’s statement nonsense) for mistakenly saying that temperatures had slightly fallen in the last few years. Worse still, one climate scientist from the UK Met Office actually defended Gore on Radio 4, giving a deceptive and misleading answer to a question from John Humphrys. Well, I’m pleased to be able to say that I have found that there is at least one honest climate scientist on the planet. He wrote an e-book in response to Gore’s film remarkably quickly, but I have only just become aware of it. There’s also a brief video interview with Spencer (“Al Gore’s favourite technique is to show all kinds of things that happen in nature naturally, and then blame them on mankind”). Tags: Gore, science, Spencer. Bookmark the permalink. But, but, but Spencer is a kkkkkristian and paid by big errr oil, errr tobacco, errrr Trump to denialize the science…..
You tricked me with that title. 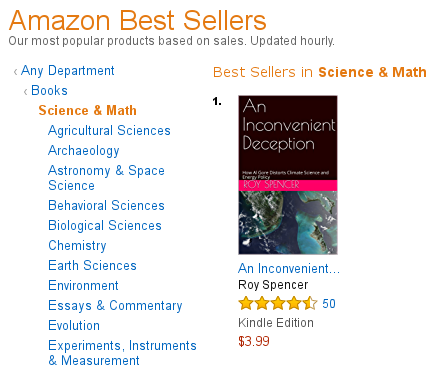 OK, I know Roy Spencer is both honest and a climate scientist. Everyone knows that. But I thought you meant an alarmist climate scientist being honest. One of the alleged 97%ers. You really had me going there for a few moments. Trickbait. I agree, you’re a tease. Luring us in with the heading. LOL. Good avert for the book though. Cliff Mass is another straight-shooting scientist, located in Seattle, a dangerous place for expressing skepticism. The thrust of his recent article: This blog will provide a careful analysis of the possible impacts of global warming on Hurricane Harvey. And the results are clear: human-induced global warming played an inconsequential role in this disaster. If I know my Classical Civ—and I don’t—that’s the unmistakable visage of Emperor Robert E Pluribus I (best known from the BBC series ‘I, Unum’), who went to his deification-bed without ever renouncing the institution of slavery. It’s incredible that such public monuments still haven’t been torn down to protect them from reappropriation by racists. But then, the Italians have always been a couple of steps behind cultural superpowers like America, haven’t they? I wonder how Tamsin Edwards would fare in your ethics challenge. *I got this factoid from the fascinating backstory of the 1977 Star Wars film, which Lucas was under a lot of pressure to rename after focus-grouping showed that the distaff half of the population wouldn’t watch anything with “War” in the title. You might be interested in reading Cliff Mass of the University of Washington (Seattle). TThis blog will provide a careful analysis of the possible impacts of global warming on Hurricane Harvey. And the results are clear: human-induced global warming played an inconsequential role in this disaster. Temperature Data, honest cli-scientists, say, Brad, what’s with a few graven images? Graven images Bethll – you mean like Mike’s hockey stick? Or the photo-shopped polar bear on a photo-shopped bergy-bit? I have noted this morning that once again at Real Climate and ATTP, there is discussion about extreme events and their attribution to climate change. Note how this always happens when there are high profile extreme events. It looks completely superficial to me. We don’t really know what the main effects on weather patterns will be of warming given how poor GCM’s are at predicting regional climate. So climatists, like moths to a flame, wave their hands and cite the Clausius Clapeyron relationship. They ignore that in fact convection strength is dependent not on absolute levels of temperature but on temperature gradients. Does anyone here know of any credible work analyzing this issue at a detailed weather level? Good point. It is interesting how the climate crisis kooks claim on the one hand that CO2 is now controlling the climate but on the other hand only make this claim when thecweather is bad. David, yes, it is absolutely gobsmacking that so many climate ‘scientists’ seem to think that weather is driven by temperature, when of course anyone who has taken any elementary meteorology course (or even anyone who hasn’t but owns a brain) knows that weather is driven by temperature differences. Does anyone here know of any credible work analyzing this issue at a detailed weather level? When will you be as open to skeptics posting and permit us to do at your site what yoyvdo here: post freely? As to the article you posted, thanks for confirming that weather is formed by differences in temps and pressure. For ATTP’s benefit, I did a quick read of the relevant section of Holland and Imanuel’s writeup and I would characterize it as thermodynamic handwaving, so it doesn’t really address my question. I noted that a key ingredient of calculating the thermodynamic efficiency of a storm is the vertical temperature gradient. Shouldn’t that get smaller with warming? If lapse rate theory is correct, it should decrease. But I am not convinced lapse rate theory is correct. In any case, the methods only give upper bounds on intensity, not average intensity, frequency of storms, etc. It seems to me like an area where there is rather profound ignorance. Hunter, I think the answer to your question is that a younger and less mature person like ATTP has less experience dealing with sharp intellectual disagreements and thus often gets an emotional stress reaction rather than a clear thinking reaction. That also comports with his own reflections on his “engagement.” Running an echo chamber is vastly less stressful. That’s understandable but not really helpful for the rest of us. That’s why I tend to pay more attention to very senior people, they are more likely to have the maturity to think clearly.